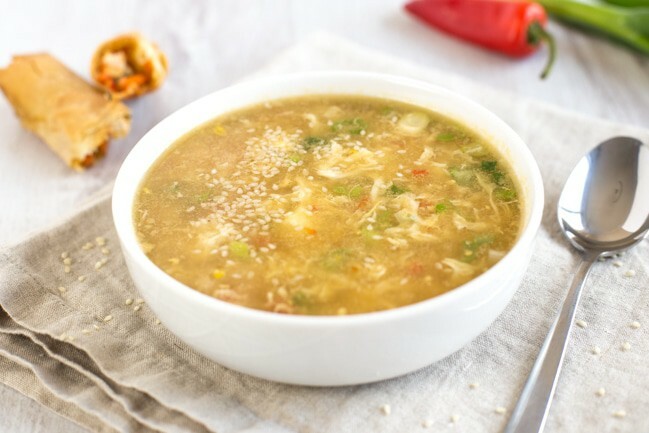 I first discovered egg drop soup a few years back – in fact, it was one of the very first recipes I ever posted on this blog way back in 2011. You can find it if you use my search bar… but I wouldn’t recommend it. The recipe itself is a little questionable, and the photo (singular) is enough to put you off for life. I thought it deserved a bit of a revamp (read: it deserved to be changed in just about every single way), so here’s its current form: sweetcorn egg drop soup. To be fair, it’s pretty hard to make egg drop soup beautiful – it does look a little odd. 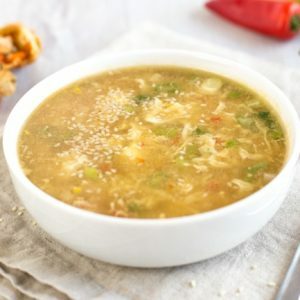 If you’ve never had it before, it’s a kind of ‘does what it says on the tin’ kind of recipe – it’s a Chinese soup that’s had beaten eggs dropped into it, so they cook right into the soup and give an unusual (but not at all unpleasant!) texture. It’s a great way to make a simple, brothy soup feel much more hearty and filling. Some red chilli and green spring onions go a long way to making it more attractive, with their flecks of vibrant colour, but it’s still not exactly a stunner. Luckily, the flavour of this sweetcorn egg drop soup is lovely. The base of the soup is a paste made from red chillies, garlic and sweetcorn kernels – then you just add some veggie stock (we’ve not got a huge number of ingredients here, so make sure you use the good stuff! ), spring onions and those all-important beaten eggs, and you’re pretty much there. I also scattered a few sesame seeds on top of my soup, purely to make it marginally more attractive. It needs all the help it can get. 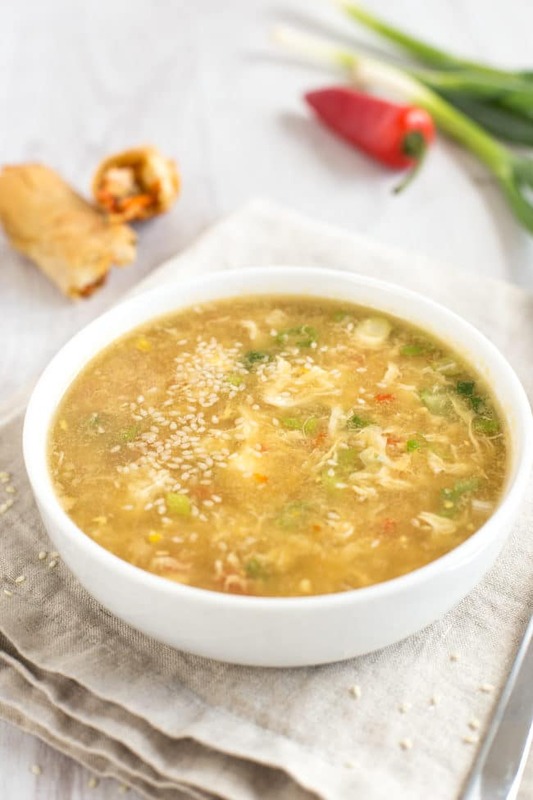 Overall, this sweetcorn egg drop soup is light, but still fills you up – often a tricky balance to find. It’s really low calorie, so I served mine with some veggie spring rolls for dipping. They’re not essential, but definitely recommended (when are extra spring rolls ever not recommended?). Add the red chilli and clove of garlic to a food processor, along with about 2/3 of the sweetcorn. Blitz to form a coarse paste. Heat the sesame oil in a saucepan, and add the sweetcorn paste. Cook over a medium-low heat for a couple of minutes, until fragrant. Add the cornflour, and mix well. Add the vegetable stock and soy sauce, along with a generous amount of black pepper and the remaining 1/3 of the sweetcorn. Stir gently to incorporate the sweetcorn paste, using the back of the spoon to break up any lumps. Bring to a simmer, and cook for 5 more minutes. Lightly beat the eggs in a separate bowl. Over a medium heat, slowly pour the eggs into the soup, and stir gently as they cook (more vigorous stirring will lead to smaller strands of egg). Add the chopped spring onions, cook for 1 more minute or until the egg is completely cooked, then serve topped with sesame seeds if desired. 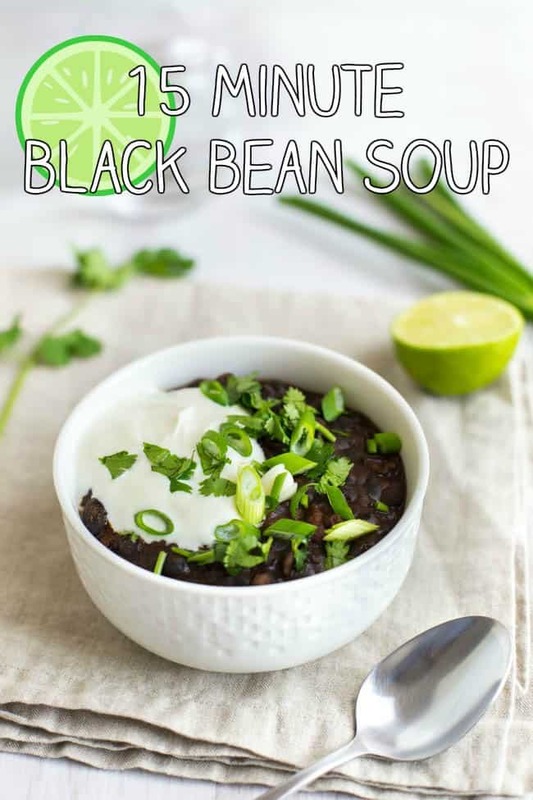 If you want something a bit more hearty, my 15 minute black bean soup is really quick and easy, and full of flavour! A nice balance between awesome flavour and being easy to make. Just the right amount of chilli for someone who likes a little warmth without burning! 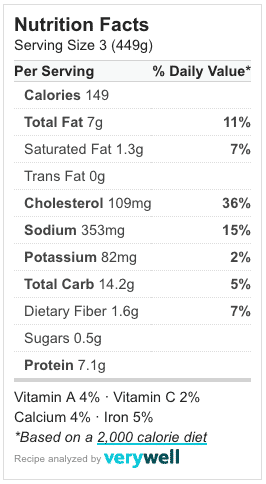 Tried it tonight and it tasted great. I added some ginger and onion to the sweet corn paste for extra flavour. Thanks Debbie, glad you enjoyed it! Well done. You’ve managed to make the soup look most appealing. Quite a hard feat I expect! 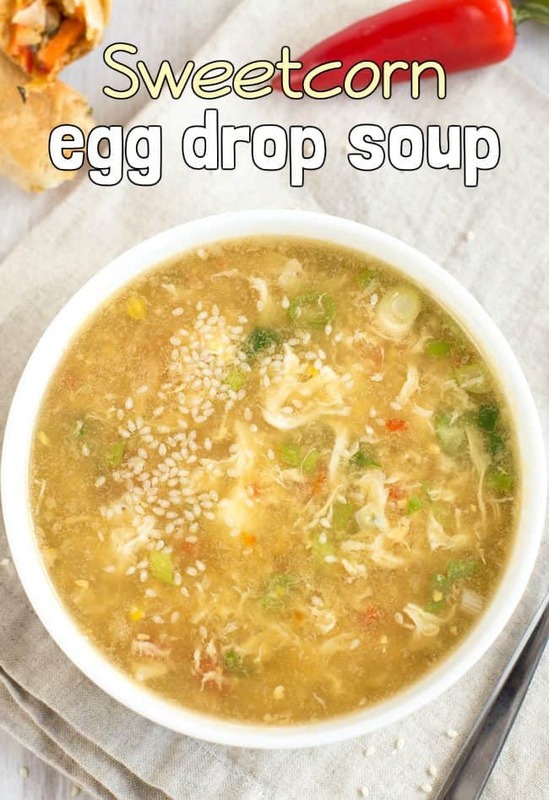 I’ve never heard of egg drop soup before but the sweetcorn paste you make at the start sounds lovely and adding the eggs must make it more filling too. Yum! This is very similar to the chicken and sweetcorn soup I make. I bet it tastes equally delicious as a vegetarian option. 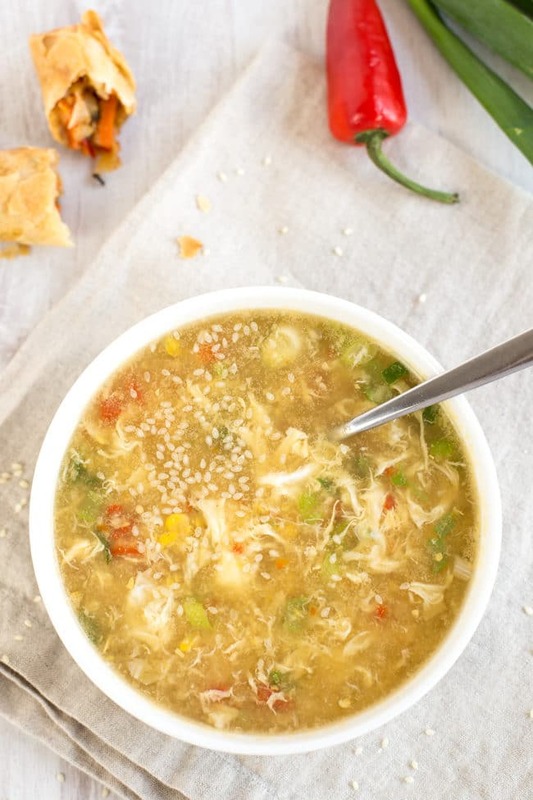 I find egg drop soup is something you need to get a taste for. It’s not really the taste, but the look and consistancy. But without getting hung up on that, they are lovely flavoursome soups and great for a meal. Adding sweetcorn is a lovely idea. Delicious. Yes you definitely have to look past the appearance haha, but it tastes really good. My daughter would love this recipe! She’s a sweetcorn addict! This looks like it needs to be made today! I love soups for lunch and am always looking for new ideas. Yes I’ve had it a lot at Chinese restaurants, but it seems a lot of people haven’t heard of it before. Definitely one to try at home! Looks delicious and healthy, it is definitely on my to do list for this weekend , love the touch of mild heat from red chili peppers, thanks for sharing! Well that is different and I am definitely intrigued by the sound of it, not to mention it looks delicious. Definitely want to give this a try! If you’ve not tried egg drop soup before you should give it a go, it looks a bit odd but tastes really good!